In my first book, The Madness of King Nebuchadnezzar (1999), a revised version of my dissertation, I read closely the story in Daniel chapter four of Nebuchadnezzar’s fabulous transformation into an animal, explore its ancient Near Eastern roots, and trace its remarkable history of interpretation. The textual history of the story is rich, though I was particularly intrigued by two other aspects, the reception history of the story in Christian sources written in Syriac, and the role of the book of Daniel in the Qumran community. In my next two books I pursued both of these interests. My second book,The Syriac Apocalypse of Daniel (2001), offers a critical edition and annotated English translation of an intriguing, yet little known Syriac text, Harvard Ms Syr 42, an early Christian apocalypse modeled after the biblical book of Daniel and written in Syriac in the seventh century CE. 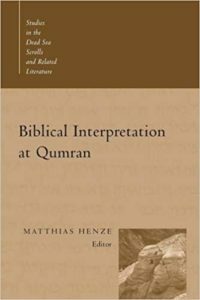 My first edited volume, Biblical Interpretation at Qumran (2005), grew out of a conference I organized at Rice on the multiple ways in which the biblical text was received and recited, copied and corrected, meditated and mediated at Qumran. Working on the Qumran volume I realized that there was no systematic introduction to biblical interpretation in the Jewish literature in between the Hebrew Bible and rabbinic literature (roughly from the third cent. BCE to the second cent. CE). I then invited eighteen international experts in the field to write contributions for the Companion to Biblical Interpretation in Early Judaism (2012). The Companion includes articles on early biblical interpretation, ranging from inner-biblical interpretation, the use of the Bible in wisdom and apocalyptic texts, in Hellenistic authors, at Qumran, and leading up to early rabbinic sources. 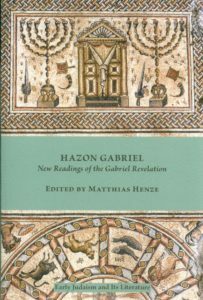 Another edited volume, Hazon Gabriel: New Readings of the Gabriel Revelation (2011), brings together two critical editions of this recently rediscovered and controversial ancient Hebrew inscription. It also includes eight photographs of the stone and a number of articles by the leading authorities in the field. 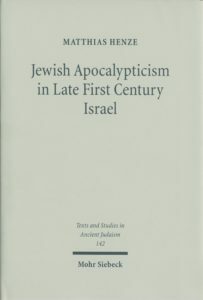 In my most recent monograph, Jewish Apocalypticism in Late First Century Israel (2011), I turn my attention to Second Baruch, an early Jewish apocalypse that is often quoted by modern scholars but rarely studied in its own right. I explore this intriguing ancient text and explain its composition and purpose. But my book has a larger aim in mind: to demonstrate how a close reading of the so-called Pseudepigrapha--in this case, of Second Baruch--will change our perception of Judaism at the turn of the Common Era, and, more specifically, will help us correct our assumptions regarding the context from which rabbinic Judaism and early Christianity emerged. Two books appeared in 2013. 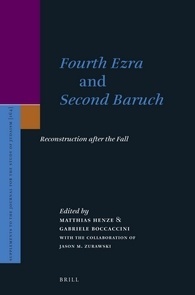 The first, Fourth Ezra and Second Baruch: Reconstruction After the Fall (2013), edited with Gebriele Boccaccini and Jason Zurawski, is a collection of twenty articles that were first delivered at the 6th Enoch Seminar in Milan, Italy in June 2011. More than merely a conference volume, the book introduces readers to the current research on these two first-century Jewish apocalypses. 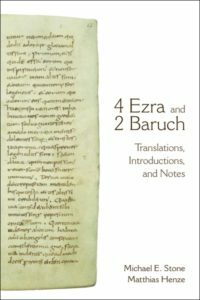 The second book, 4 Ezra and 2 Baruch: Translations, Introductions, and Notes (2013), written with Michael E. Stone, provides fresh translations of the two texts, with introductions to both apocalypses, textual notes, and cross references in the margins. 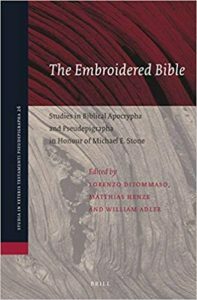 The Embroidered Bible: Studies in Biblical Apocrypha and Pseudepigrapha in Honour of Michael E. Stone. Edited by Lorenzo DiTommaso, Matthias Henze, and William Adler. Studia in Veteris Testamenti Pseudepigrapha 26. Leiden: Brill, 2018. xlvi + 1,054 pp. 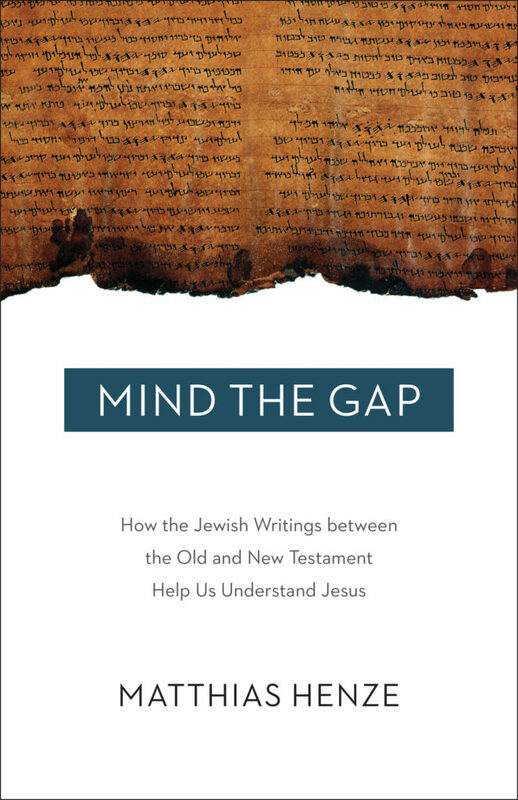 Mind the Gap: How the Jewish Writings between the Old and New Testament Help Us Understand Jesus. Matthias Henze. Minneapolis: Fortress Press, 2017. ii + 235 pp. Fourth Ezra and Second Baruch: Reconstruction After the Fall. Edited by Matthias Henze and Gabriele Boccaccini, with the collaboration of Jason M. Zurawski. Supplements to the Journal for the Study of Judaism 164. Leiden: Brill, 2013. xvi + 456 pp. 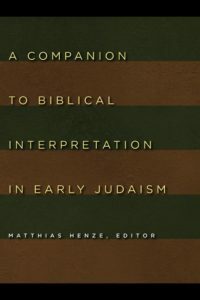 A Companion to Biblical Interpretation in Early Judaism. Edited by Matthias Henze. Grand Rapids: Eerdmans, 2012. xv + 568 pp. Jewish Apocalypticism in Late First Century Israel: Reading Second Baruch in Context. Texte und Studien zum Antiken Judentum 142. Tübingen: Mohr Siebeck, 2011. x + 448 pp. Hazon Gabriel: New Readings of the Gabriel Revelation. Edited by Matthias Henze. Early Judaism and Its Literature 29.Atlanta: Society of Biblical Literature; Leiden: Brill, 2011. xiii + 219 pp. Biblical Interpretation at Qumran. Edited by Matthias Henze. Studies in the Dead Sea Scrolls and Related Literature. Grand Rapids: Eerdmans, 2005. xiii + 214 pp. 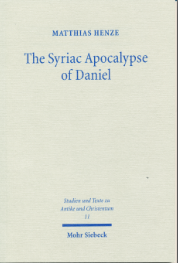 The Syriac Apocalypse of Daniel: Introduction, Text, and Commentary. Studien und Texte zu Antike und Christentum 11. Tübingen: Mohr Siebeck, 2001. v + 158 pp. 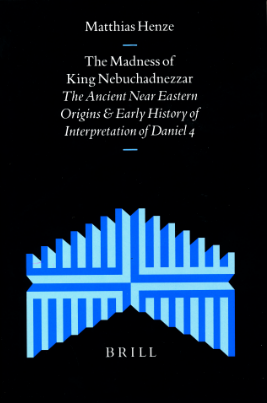 The Madness of King Nebuchadnezzar: The Ancient Near Eastern Origins and Early History of Interpretation of Daniel 4. Supplements to the Journal for the Study of Judaism 61. Leiden: Brill, 1999. xii + 295 pp.